From the Book Jacket: James Otis knows what it's like not having much. Still, he just has to find a little bit of something to share with Sarah, whose family has lost everything in a fire. But what does he have that she would want? His beautiful sparkling rock? Naw, that wouldn't help - you can't ear a rock. His crayons? No way, even if only a few colors are missing. Then he remembers what Reverend Dennis said one Sunday - What is given from the heart reaches the heart - and it gets him to thinking... This is a heartfelt picture book about the power of kindness and the joy of giving by a master storyteller and a renowned artist. Why It's On My Bookshelf: April is the month of giving at my school. When we ask students to bring in items for a food drive, it's important that we give them an understanding of why we are doing a community service project. Reading books about homelessness, hunger, and poverty has been a helpful resource to educate kids about issues others are facing. 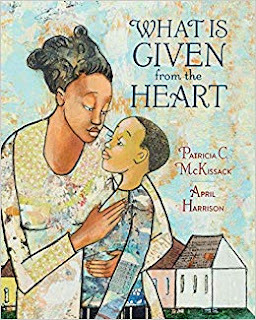 This is a new book to my shelf and it really reached everyone's hearts and helped enhance the spirit of giving that we were trying to achieve.